A man has been punished in a really hilarious manner by his girlfriend after he was caught cheating by her. A woman identified as Darneisha Shereese, has revealed how she punished her boyfriend after he was caught cheating. 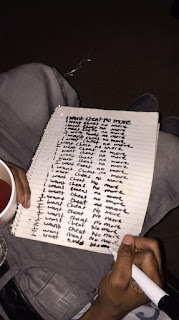 Darneisha revealed that she made him write the words “I won’t cheat no more” on papers for as many as 224 times. 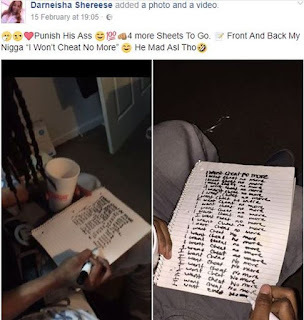 She shared a video of her man serving out his punishment as he sat writing down the words on a piece of paper. According to her, he still had four more sheets to cover, front and back.